I like the idea of making something that can last for months in my fridge, and that I can use it later on to flavor my desserts and sweet cravings. It has been quite a while since my last “Basics” post. And I know we are not even Friday, but I wanted to share with you this basic recipe that will add a nutty, rich touch to your custards, ice creams, cakes or butter creams. 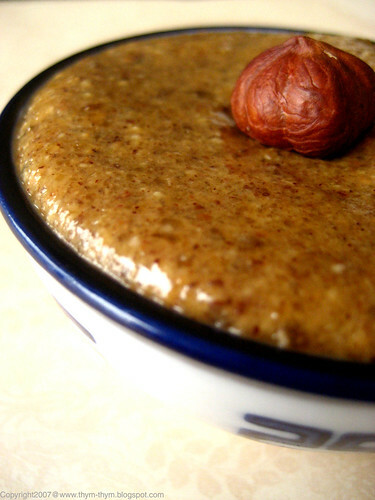 Praline is a nougatine (caramelized sugar and nuts) ground to a paste. The nuts are usually almonds or hazelnuts, or a mix of both. In Louisiana and Texas, pecans are almost always used. Praline is obtained by using a special machine that crushes and reduces the cold nougatine mixture, in the process of which some of the essential oils from the almonds are extracted. A food processor doesn’t achieve the exact effect but creates good enough reproduction. The word praline can vary from a country to another. It can refer to the praline candy that is most popular in New Orleans (made with nuts sugar and cream) or to the praline paste (pictured above) or to the praline coated nuts that are served to my father on every New Year’s Eve. Place the nuts on a tray and roast in a preheated 350F oven until golden brown. Place the sugar in a heavy saucepan and mix in the water. Stir this just once then place on the stove. Cook on medium-high heat until it turns into a nice golden caramel color. Oil a cookie sheet lightly and set aside. Add the nuts to the caramel, carefully remove from the stove and shake gently to mix well. Pour the mixture on top of the oiled cookie sheet. Let cool until hard and brittle. At this point with call it nougatine (brittle) and you can break it and store it in an airtight container in the fridge for and kept for months, using to decorate custards and ice cream. To continue with the praline recipe (you’re not lost, aren’t you?) break the brittle in a mortar into large crumbs. Place them in the food processor and powder for 1 minute. It should begin to look crumbly and soft and slightly sticks to the sides of the food processor. Add the oil and blend for another 2 to 3 minutes, stopping the machine every 20 or 30 seconds until it looks pasty and slightly wet. Place in a jar in the refrigerator and keep for months, using it to flavor ice creams, chocolate truffles, custards and butter creams. Préchauffer le four à 180C. Mettre noisettes et amandes dans une plaque de cuisson et faites griller jusqu’à ce qu’elles deviennent dorées. Mettre le sucre et l’eau dans une casserole à fond épais. Mélanger une fois et faites cuire sur feu moyen jusqu’à une belle caramélisation. Ajouter les noisettes et amandes grillées au caramel et mélanger doucement afin que le mélange soit homogene. Verser sur une plaque de cuisson huilée et laisser refroidir et durcir. A ce stage, on l’apelle nougatine, et vous pouvez la briser et la mettre dans un bocal à fermeture hérmétique au frigo. Elle peut se garder pendant des mois, et l’utiliser pour décorer crème glacée au pralin et flans. Pour continuer avec la recette du pralin (vous me suivez toujours?) mettre la nougatine dans un mortier et réduire en une poudre grossiere. Verser la poudre dans un robot ménager et réduire en une poudre fine et réguliere. Ajouter l’huile d’amande ou d’arachide et continuer a mixer pendant 2 a 3 minutes, en arrétant le robot chaque 20 ou 30 secondes jusqu’à ce que le mélange ressemble à une pâte souple. Le pralin se garde au frigo dans un bocal à fermeture hermetique pendant des mois. Vous pouvez l’utiliser pour parfumer vos crème glacées, flans, crème au beurre et truffes au chocolat. I just finished my last jar..no kidding! I go through that stuff like crazy, especially in brownies. Looks great like always Rose. It would be good to see a post or two with this used in a recipe as even though I have heard of it and eaten it I think it would still be helpful to see some examples. Thank you! Cette pâte est terrible car elle se laisse manger à la cuillère, alors il faut toujours en faire plus pour en avoir suffisamment pour les recettes! - Helene, I am getting so addicted to it too. I can't stop eating it straight from the jar. And thanks for the header. - Shayne, thanks my dear. Hope you're doing fine. - June, you're right! That's what I have planned to do for the next post. See you there! What an informative post! I always thought praline was the nut -- specifically a pecan -- because that's the way I've heard the word used. Now I know better! - Lydia, thank you very much my dear friend. And I always thought of praline as the nuts coated with praline. Now we both know. Thanks to Jacques Pepins. - Cocotte, tres contente de te servir.